Ever since I heard that the two central actors previously featured in The Innkeepers – Pat Heley and Sara Paxton – would be starring together in a new film called Cheap Thrills, I’ve been hotly anticipating getting the chance to check it out. After a promising teaser trailer, I was delighted to see the film programmed at this years After Dark Film Festival. Cheap Thrills is a darkly satirical thriller from first-time director E.L. Katz about Craig (Pat Healy), a loving father and husband who is not only less than a month away from foreclosure on his family’s residence, he’s also just been fired from his job as a mechanic. It’s safe to say that Craig has about reached the end of his rope – both financially and mentally. He takes solace at the local watering hole, where he runs into his old high school friend Vince (Ethan Embry) who has taken to a rougher kind of employment in the past five years. While drinking, the two befriend Colin (David Koechner) and Violet (Sara Paxton), a bored and wealthy couple celebrating a birthday who instantly begin throwing their money around in a series of bets for their own amusement. At first, the stakes are low – money to the first person to throw a dart into a 50 dollar bill – but the film steadily ups the ante with each subsequent bet. After moving to Colin and Violet’s upscale mansion, things take a real turn for the depraved – how far are Craig and Vince really willing to go to score (or in Craig’s situation, reclaim) their slice of the american dream? Cheap Thrills manages to execute what many films try and fail to do – deftly balance the social and political satire with black-as-night comedy, while still operating as a serviceable and entertaining thriller. The screenplay from Trent Haaga (of Deadgirl previously) and David Chirchirillo never falls too deep into preaching the central morality tale at the audience. Any screenplay that doles out one escalation after another is bound to hit some awkward turns – and Cheap Thrills has one or two – but mostly the film offers a slow and steady ratcheting up of the suspense. Thankfully, the performers are no slouches either. Pat Healy plays a believably desperate every-man with gusto, while Ethan Embry disappears into the street-tough former friend. 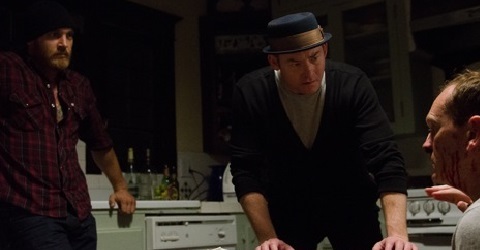 David Koechner puts in the best performance of his career, adding palpable menace to his comedic bravado. His character Colin gets many of the bigger laughs, but Koechner’s performance also employs seriously effective turn-on-a-dime moments. Sara Paxton’s silent and often uninterested Violet requires a lot of subtle craft that Paxton is more than willing to bring to the table – if you thought her turn in The Innkeepers was a fluke, you might be surprised at how far she is away from the whimsy of that film’s early moments. With Cheap Thrills, director E.L. Katz has a firecracker of a debut – one that blends rock solid performances and steadily paced plotting into a potently satirical, disturbing, and at times thought-provoking horror-thriller. The film hits VOD in January of 2014, before receiving a limited theatrical release in February – and then moves on to DVD and BluRay. Cheap Thrills is definitely a film you should support, and E.L. Katz is certainly a talent to watch – I’m especially interested in what kind of projects he moves on to after contributing to the upcoming ABCs of Death 2.